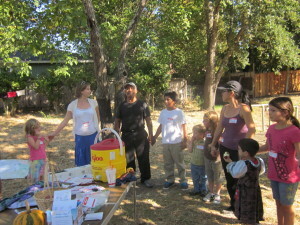 JCNA meeting rallies support for our neighborhood youth-inspired projects in the Poppy Creek Green Space!! The idea for this project came from our neighborhood youth, and evolved out of a series of gatherings in the Poppy Creek Green Space that included trash pick-ups and creek clean-ups with Alistair Bleifus, and a Halloween party with craft making and story telling. Several brainstorming sessions were held, in which children and adults expressed their ideas about what might help improve this little piece of green space, which is so often the recipient of discarded pieces of furniture, mattresses, and a shocking abundance of dog waste. The final decision to build a beautiful bulletin board, set at a height that children can access, with an attached hand carved sign to give the space a sense of ‘place’, and with a receptacle for dog waste bags attached to one post, was finalized after a meeting with city Park and Recreation Department staff, Lisa Grant , Dean Hamlin, and Alistair Bleifus, 2 years ago. We had been calling the space ‘Poppy Park’, but after being informed that we couldn’t refer to the space as a park, we did a neighborhood survey, and came up with the name ‘Poppy Creek Green Space’, which was approved by Superintendent of PArks and Rec, Lisa Grant, and was hand carved into a gorgeous wooden sign last year, designed to be attached to the bulletin board. A collective of individuals, families, and neighborhood organizations, stand prepared to maintain our work, which was designed and built with input and participation from over 30 children and adult neighbors. City technician/engineer, Robert Riley, came to the neighborhood last year, for a tour of the installation site and an examination of the completed structure. He was extremely positive about the structural integrity of the board and expressed strong support for the project as a whole.We have established guidelines for the use of the board, which will be posted in English and Spanish. The guidelines specify what type of material/information will be allowed on the board, and in what order of priority. Any literature pertaining to the stewardship of the Poppy Creek Green Space and Poppy Creek itself, has first priority on the board. as well as any artistic expressions or creative ideas coming from the youth, will also have a place on our board. We have a furniture maker, wood workers, and a general contractor, who live within a few blocks of the Poppy Creek Green Space, who all stand poised to look after the structural and aesthetic integrity of the structure on an on-going basis. Bunni Zimberoff, who has been the volunteer steward for this piece of land for the past 8 or 9 years, and has worked closely with Alistair on trash removal and other issues related to maintaining that space for all that time, is actively involved with this project (she volunteered time, resources and creative input toward the creation of the carved sign), and will be one of the many people keeping an eye on it. Her history of ongoing, active involvement with the monitoring of this little piece of land, is a major asset to this project, and our neighborhood in general. Hank Topper, our Junior College Neighborhood Association President, and the Junior College Neighborhood Association organization as a whole, plans to be actively involved in the monitoring of the bulletin board and the stewardship of the Poppy Creek Green Space. Also, the Junior College Neighborhood Association recently hired two bilingual neighbors to do outreach in the Latino community. One of them, Santiago Avila, has been involved with Growing a Village/Cultivando un Pueblo from the beginning, and, along with his son, Eduardo, was actively involved in the evolution of our Poppy Creek Green Space project. We anticipate the installation of our bilingual board to really galvanize the movement to unite diverse communities in the neighborhood, with a common interest in caring for the land, the creek, the children, and each other. Suzanne Doyle, a neighbor that has been involved since the beginning, and has a long history creating school gardens and taking leadership roles in various environmental stewardship related projects, will remain actively involved in oversight and maintenance of the board and the space. Carol Tuttle, and the Tuttle Family Day Care, which is one block from the Green Space, and has been actively involved in this from the beginning, will be involved in the creative displaying of children’s art. Growing a Village/Cultivando un Pueblo, a JC neighborhood based organization that works to build multi-cultural, intergenerational bridges between neighbors through participation in youth inspired projects, initiated the events that led to this project, and will continue to be integrally involved in it’s maintenace and oversight. 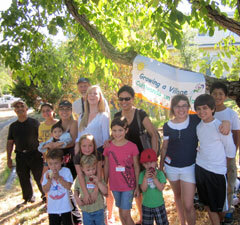 Growing a Village/Cultivando un Pueblo has engaged over 120 youth and their families in the neighborhood in projects that have included a children’s community garden (on private property, but open to all), bilingual songwriting, art projects on recycled materials, stewardship of neighborhood creeks and parks (for which we received an award of recognition from the city Parks and Recreation Department in 2012 and two CAB grants) and more. Please let us know if you have any questions, or if there is anything else you need for us to do, in order to have our project installed in the space for which it was built. Thank you.